Smith & Wesson Forum - Intermarkets Inc.
Smith & Wesson Forum attracts gun enthusiasts and Smith & Wesson collectors alike as a top destination for discussing firearms and related topics. As the second largest brand-specific gun forum on the Web, Smith & Wesson Forum is the official home of the Smith & Wesson Collector’s Association. The Forum boasts a loyal and growing base of active participants—making this the perfect platform for connecting with an established, hard-working, patriotic male audience. 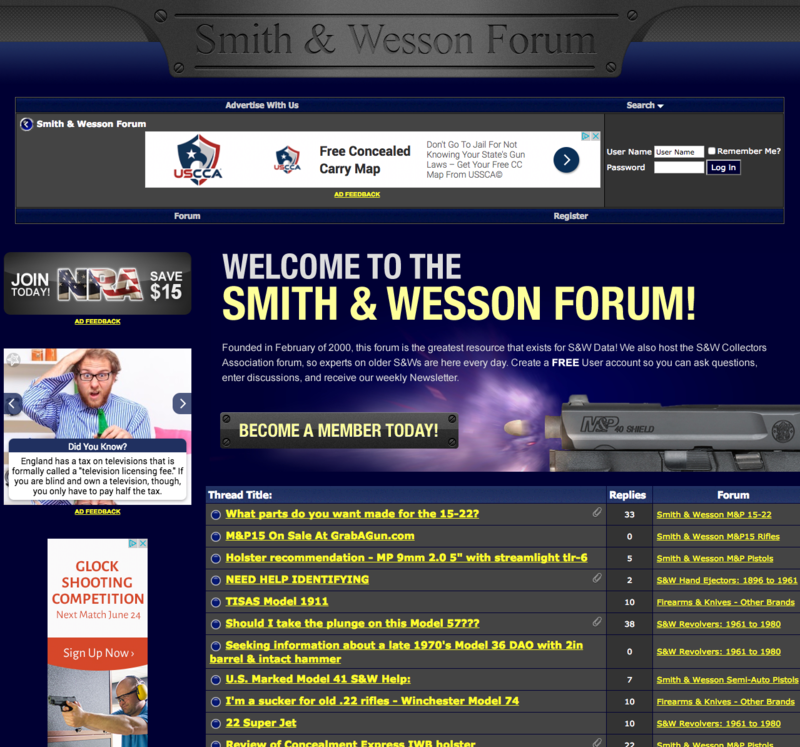 Smith & Wesson Forum members are passionate about firearms—guns, gear and causes. They ONLY buy American—especially domestic autos—and comprise an extremely powerful group of online collectors, buyers and consumers. Brand and product advertisers consistently find success because of S&W forum’s purchasing power and generous amounts of time spent on the site. This smart and diverse audience is highly engaged and could be the perfect fit for your product, service or cause.